Apple and Samsung are back in the High Court in London as the former looks to escape a court order forcing it to publicly admit that the Galaxy Tab did not copy the iPad. Back in July, the court absolved Samsung of allegations that it copied the iPad on the grounds that it was "not as cool" and decreed that Apple must place advertisements in UK media saying Samsung did not infringe upon its patents. Cupertino is now attempting to wriggle out of what would be an galling, embarrassing, and shallow admission by contesting the original verdict. Michael Silverleaf QC, representing Apple, said too much emphasis was placed on the Galaxy Tab's two-tone backplate, (compared with the silver-backed iPad) when clearing Samsung of wrongdoing. "I say he [the judge] was wrong to take these aspects [of colour] into account at all," Mr Silverleaf told three senior judges on Monday. "This [the iPad] is a design about shape. You don't make a non-infringing design by making the same shape and decorating it. "Too much weight was given to the features of the back and far too little weight to the features of the front." In response, Samsung's lawyers reaffirmed the argument that Apple was simply seeking a monopoly on the most basic tenents of tablet design. The company also reiterated claims that Apple exaggerated images to make the two devices look more similar when stating its original case. Following the original verdict in Samsung's favour in July, Judge Colin Birss said Apple must place a notice on its UK website for six months clearing Samsung of wrongdoing. Apple was also ordered to take out ads in T3, the Daily Mail, Financial Times and Guardian Mobile magazine, in an attempt to repair damage the allegations may have caused to Samsung's reputation. The three judges have now retired to consider the appeal and, if Apple loses again, it could take one more shot at overturning the decision at the last chance saloon - London's Supreme Court. 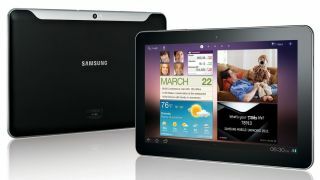 There hearing follows the announcement on Friday that the sales injunction placed on the Galaxy Tab 10.1 in the United States would be reviewed by Juge Lucy Koh. The global battle legal between the tech behemoths rages on, with no sign of a conclusion. Unfortunately.